Besides giant Slaaneshii Daemons another of my passions is humongous space battles, or as they’re commonly known by the more boring name 4x. 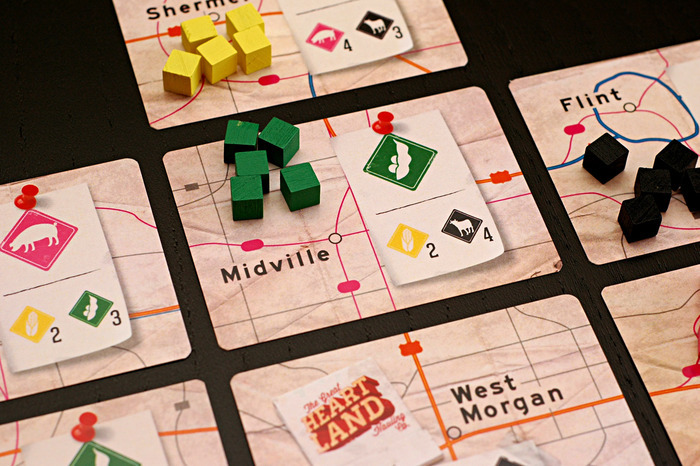 If you’re not familiar with 4x games it stands for eXplore, eXpand, eXploit and eXterminate. In general you’ll fly around a galaxy, expanding your territory, fighting other players, and researching cool technology. 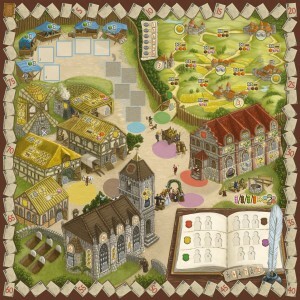 Not all 4x games are space based, Civilization is one of the classics, both on the computer and table top. 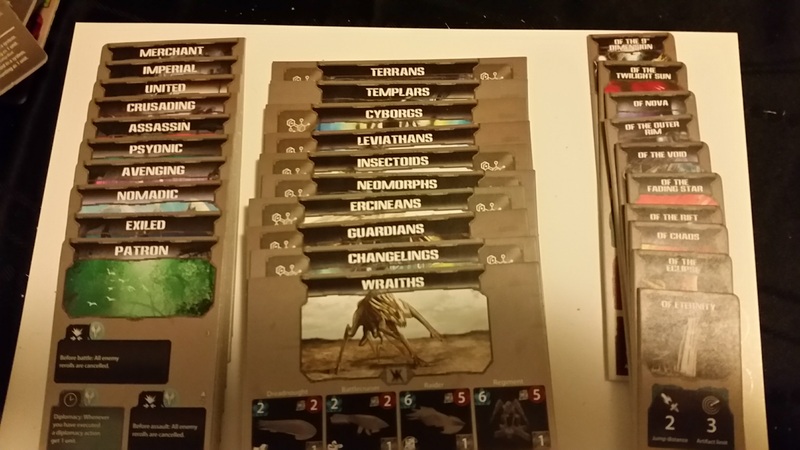 In my collection there is also Space Empires 4x (uncharitably called The Spreadsheet Game by some), Eclipse, EVE, Empires of the Void, Star Trek Frontiers, and Hegemonic. Plus, the not space themed, Mage Knight, Scythe (maybe only a 3x?! ), and Tiny Epic Kingdoms (certainly the quickest of all of these). 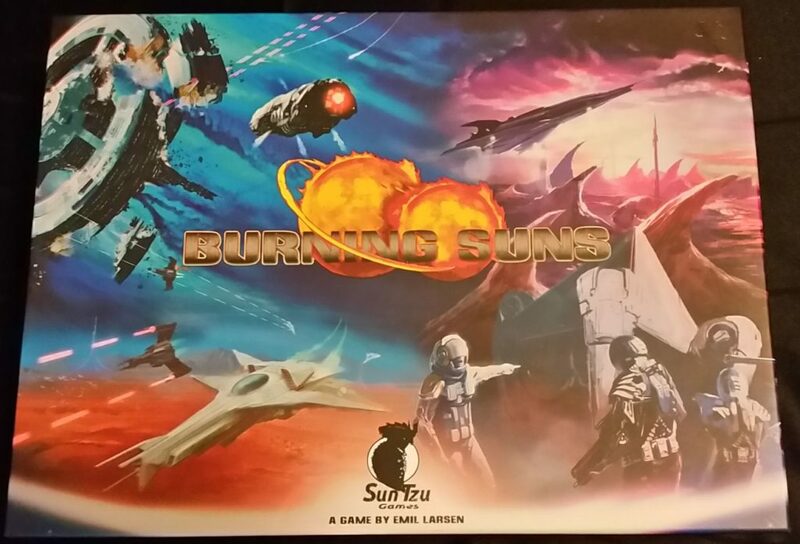 Well, to these hallowed ranks is added Burning Suns. 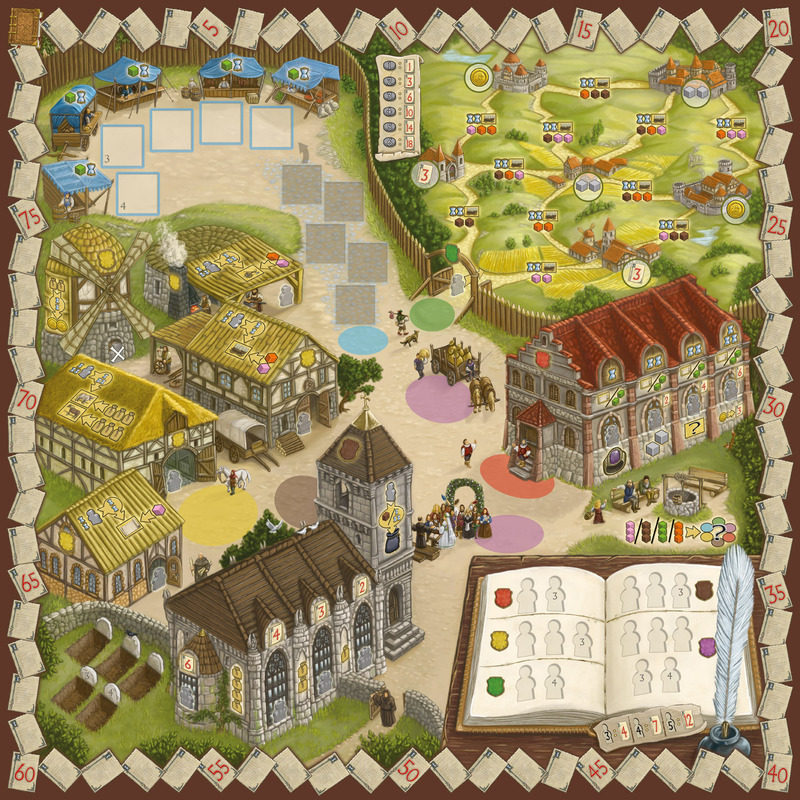 This is also one of the oldest games I’ve kickstarted, with a projected delivery date of September 2013! That’s right, the game arrived almost exactly 4 years late. That said the components are pretty decent quality. The cardstock is nice and thick, everything punched out super easy. The space ships aren’t the most beautiful but they’ll do, and the game seems pretty simple for also being fairly complex. I got in a two player game, and it was definitely very back and forth near the end, however I’m sure a lot of that was just due to neither of us really knowing what we were doing yet. Each player gets a Race, Ideology and Framework. Actually you get two of each and pick your favorite until you have one of each, but the neat thing here is that since there are 10 of each there are literally a thousand different combinations, meaning every time you play the game will be a little different. 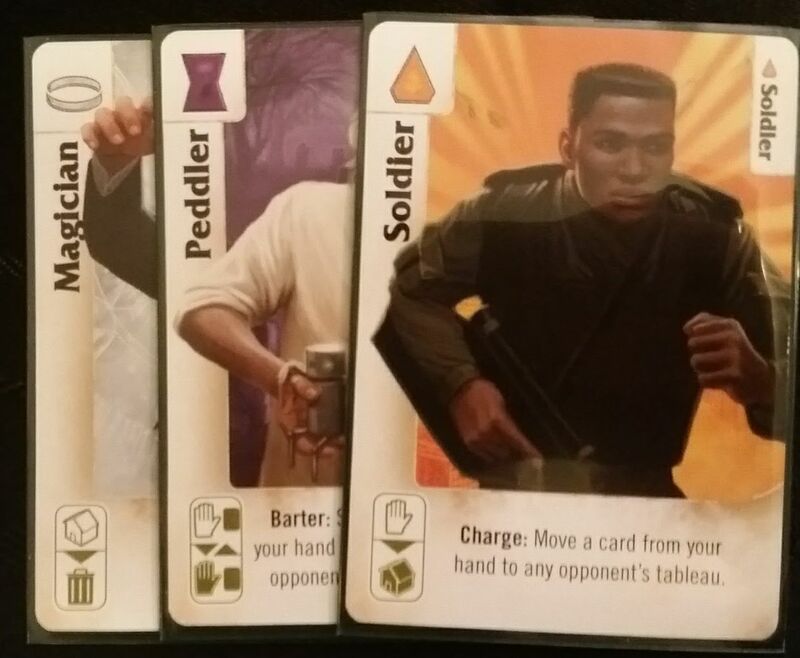 Ideology determines whether you are Light, Neutral or Dark which affects a bunch of cards in the game. It will also give you some choices as your get closer to winning the game, and those choices again affect whether you are Light, Dark or Neutral. Your Race determines the cost and effectiveness of your ships and troops, plus how many technology upgrades you can get and where. Finally your framework affects a lot of your “limits”, eg how far your ships can jump, or diplomats can Diplomasize, how things you can construct in a turn, or how many of various rerolls you get. There are peaceful and military based ways of taking over planets, though some are easier than others for various techniques. There’s a lot of stuff going on in the game, and I definitely think it’ll be more interesting to play with 3-5 players, or possibly even with 6 or more… I can sub in pieces pretty easy and the major issue will be the increased downtime (the creator has said as much). This is now one of my favorite games. 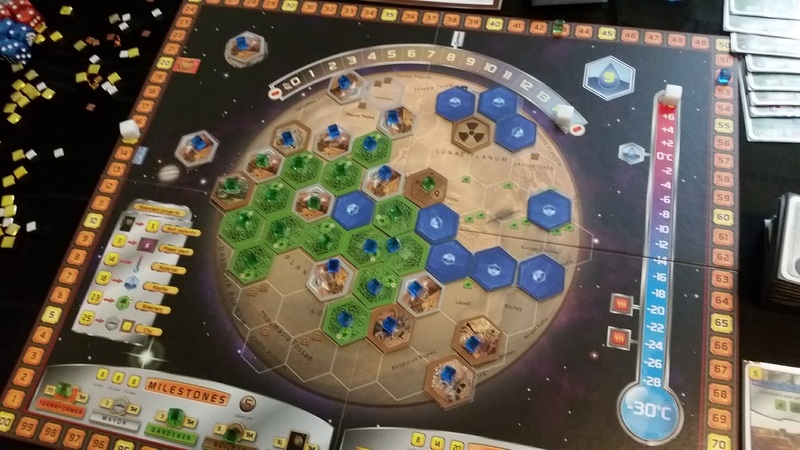 In some ways it almost feels like a cooperative game, in that you’re all working to (surprise) Terraform Mars and make it habitable for colonists. Of course it’s not really coop at all… Yes you all are working together to improve the oxygen content, heat up the atmosphere and seed oceans to turn Mars green. However whenever you accomplish one of these tasks it improves your Terraforming Rating which leads to higher profits, and of course the accolades over everyone who wants to move to your section of Mars. One of the things I particularly love about this game is that there are a wide variety of routes to winning. Doing a thing better than someone else will likely lead to you contributing the most to that factor which leads both directly and indirectly to more victory points. Want to build cities? Cover the planet in greenery? Fund Science? Achieve milestones? Just be the richest? All of these things can contribute to victory. There are two decks of cards, the regular one (about 150 cards) and the Corporate Era expansion (about 80) and every card is unique. Now rather than try and explain the rules I think it might be better to talk about some optional rules. One of them is actually in the rule book, and that’s draft the research every turn. If you’ve got anyone who has not played before you’ll definitely want to skip this… drafting requires a bit of knowledge about the game, and will give just way too big of an advantage to someone who knows how all the mechanisms interact. On the other hand once everyone has a game or two under their belt, it only adds a little time to the game, but improves the game greatly. For starters you have much less chance of getting straight up hosed by a bad draw (instead you get hosed by your neighbors hate drafting when there’s nothing they want) and second it makes it a lot easier to build towards the strategy you want instead of just having to take what the deck gives you. However an additional optional rule I made up is drafting the initial cards. Again, don’t do this if anyone has never played before, but my suggestion is for the initial 10 cards do two 6 card drafts, discarding the last card of each. One draft left, and one right. Then you buy from those 10 cards as usual, except it’ll be a much more agonizing choice of what to buy because you’ll have had much greater choice in what to take. This also vastly decreases the chance that someone will get a terrible start. And when a game takes 2-3 hours to play you really don’t want to start the game hosed. I understand the game has finally been reprinted, so if you can get a hold of copy for retail definitely pick this up. You might also want to look into some kind of third party player boards… There are some nice 3D printer files out there if you’ve got access, but you can also get some CNC acrylic or wooden boards. There are also a few DIY projects posted on Board Game Geek using magnets which works pretty well. I made some boards out of drywall corner (flattened) and thick cardstock with a printout glued on top and it works pretty well. Definitely you’ll want some kind of improved player board unless you have a very sturdy table and are careful not to bump things. 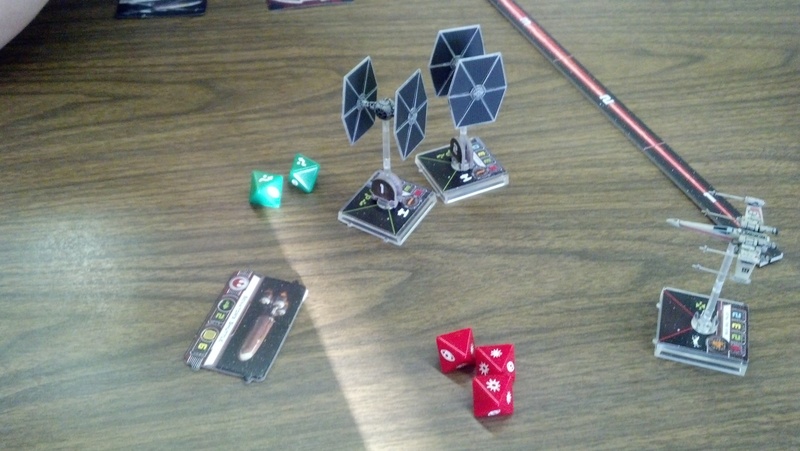 So I’m basically in love with the X-Wing Minis game. I really wish I’d gotten it earlier, on the other hand, there is now more variety in ships than I can actually afford. Even if you’re not big on Miniatures gaming, this might still have some appeal. A turn basically consists of 3 parts. First you decide how each of your ships is going to move. You do this via a special wheel that you secretly set for each of your ships. This has things on it like Hard Turn 1 left, or Soft Right 3, or 4 Straight, etc. Different ships have different movement options, and some moves are harder or easier than others. Once everyone has set their moves, every ship moves, and then can take an action (like Lock On, or Barrel Roll, and more, again they vary by ship). Once that’s done every ship fires. Then you do it again, until all ships on a side are blown up, or the mission (there are several missions) is accomplished. I’m already thinking about making a B5 Mod for this game, and possibly BSG. Space Dog-fighting is one of my favorites, so to see something super quick and easy is really nice. That said, this does also kind of make me want to pull out all of my old Silent Death stuff and try and get that going again. Legendary lives up to its name! So one of the newest games I’ve picked up is Legendary. 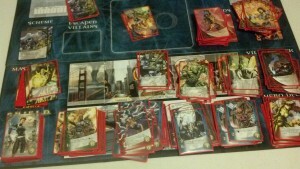 It’s a semi-cooperative Deck building game, set in the Marvel Universe. This is definitely very excellent. First off is the fact that it is semi-cooperative. That is to say either everyone wins (if you defeat the mastermind) or everyone loses. In the event that you do manage to win, there are victory points for defeating villains and saving bystanders, so one person can be the clear “hero”… the biggest winner. This makes for some interesting dynamics…early on you’ll want to cooperate, work together and try ensure everyone is making progress, otherwise things can quickly get out of hand and you all lose. Later in the game though, you may find yourself wanting to try and hose the other players so you can do all the good deeds yourself. So far we’ve played approaching a dozen games, and lost three times. All three times have been to Loki, who is admittedly the toughest of the masterminds, but even still it’s been more to bad luck… the heroes all end up being too expensive or the Scheme Twists come out too fast. The fact that almost a third of the games I’ve played have been lost actually is pretty awesome in my mind… there is little more boring then a game that you can always win… and coop games that can be even more true, even if there is an “overall winner” as is the case here. I certainly hope we get some more copies in stock at Fun-N-Games, because I will not hesitate to recommend this game to anyone (unless they love DC and hate Marvel I guess), and no one who has played it with me has had less than a great time. The game is a little confusing to setup/put away/store. The dividers are very nice, but it’d have been sweet if they were pre-labeled. Needs expansions so bad… Where are the FF? I really want Nightcrawler (my favorite Marvel character) and Dr. Strange. Doc Oc shoulda been a mastermind, not just a Spider-Foe. 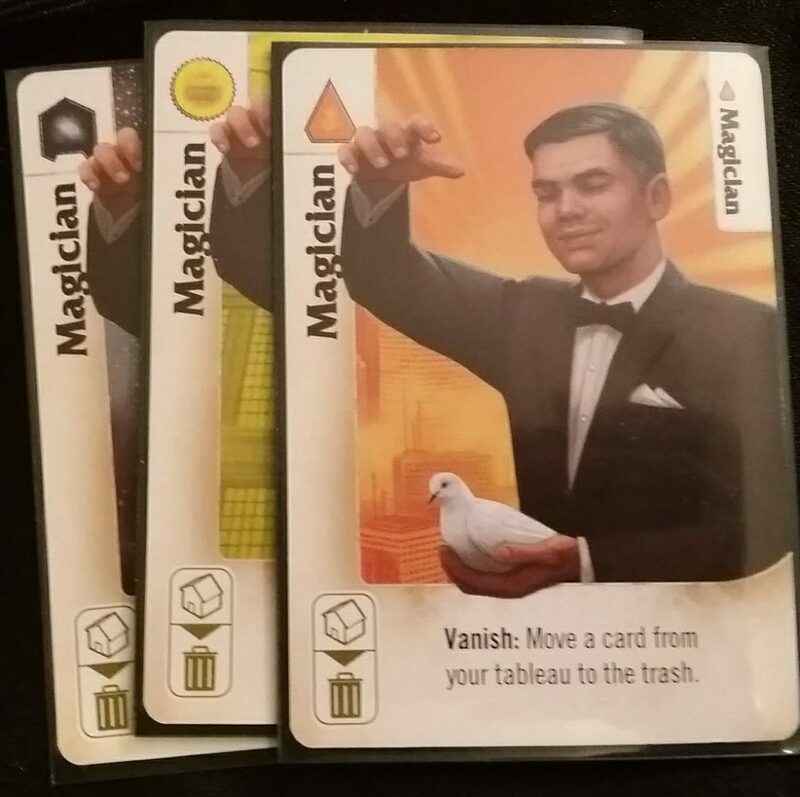 Also to anyone looking to sleeve the game, I’d suggest 2 or 3 colors of sleeves. 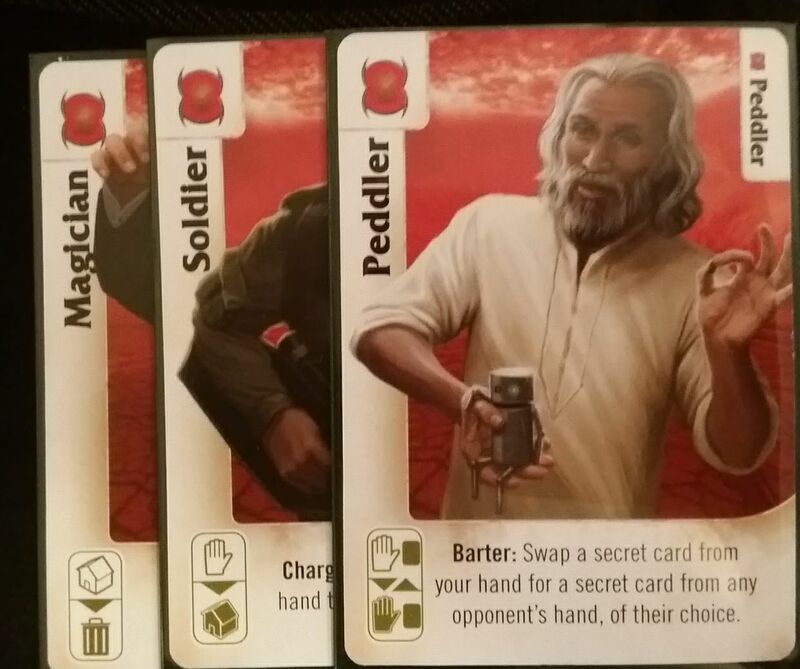 The Heroes all need to be the same color, as do the Villains, Bystanders, Twists and Master Strikes… The Schemes and Masterminds could probably stand be be a different color (and TBH, you could put each Mastermind and his 4 cards in different sleeves if you have a few extras handy. ).